Rambutan is an exotic fruit with a sweet and juicy flavor. It’s about the size of a golf ball and wrapped in a strange shell covered in reddish-orange spines, which is peeled away to reveal the pale white fruit inside. Rambutan is commonly eaten raw. It is related to lychee and logan fruits. This nutritious fruit offers many health benefits ranging from weight loss and better digestion to increased resistance to infections. 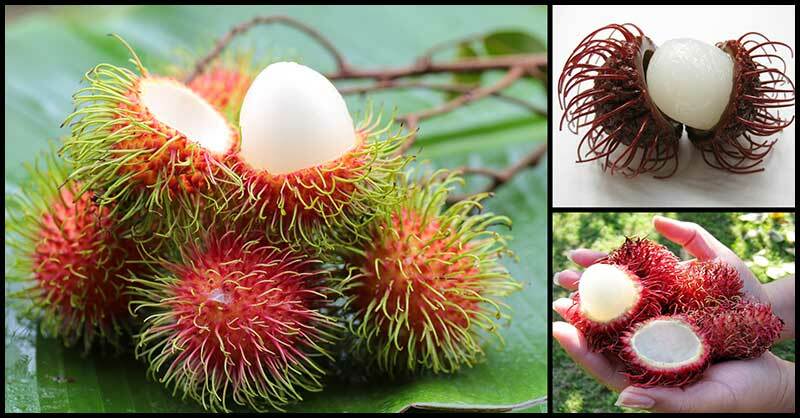 The small fruit contains small amounts of dietary fiber, protein, and carbohydrates as well as a number of B vitamins and high levels of vitamin C. Aside from this; rambutan is also rich in magnesium, manganese, sodium, phosphorus, potassium, and zinc. Plus, due to the presence of antioxidants and unique compounds such as vanillin and cinnamic acid, rambutan, rambutan contributes greatly to a person’s overall health. A 100 gram serving of rambutan contains only 75 calories. This can be helpful for those who want to lose weight as the fruit can keep them full. Rambutan regulates the digestive process and optimizes nutrient digestion so that fewer carbohydrates are converted into fats. Rambutan contains copper and iron, which are both needed in the production of red and white blood cells in our body. Copper is a mineral that helps your body use iron to produce hemoglobin so that it can manufacture more red and white blood cells that are essential for a healthy immune system. Gallic acid is an organic compound that is found in the skin of rambutan. According to studies, the compound can protect our body against oxidative damage and can be a powerful remedy against cancer. Proteins in rambutan can help improve growth and development as it is needed by the body for the production of every cell, tissue, muscle, and drop of blood. Rambutan can also help in lowering cholesterol levels and high blood pressure. Moreover, it can cut the swelling in the hands and feet caused by poor blood circulation in the body. Rambutan fruit has anti-parasitic properties which can help kill intestinal parasites and help with symptoms of fever and diarrhea. Rambutan has a high water content which aids in giving back the energy you have used. Also, due to its richness in carbohydrates and proteins, the fruit can help prevent bloating. Rambutan contains high amounts of phosphorus which effectively help filter out waste matters. Rambutan is a good source of soluble and insoluble fiber, which can prevent constipation and improve symptoms of certain gut disorders.